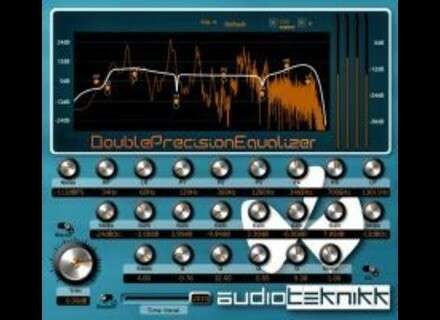 AudioTeknikk has updated Double Precision Equalizer to 0.60 beta. 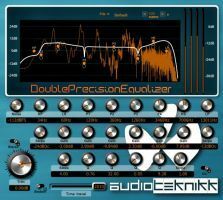 Double Precision Equalizer got its name because it uses "double precision floating point stream" in the critical parts of the calculations, according to AudioTeknikk. This is meant to be an EQ with minimal digital artifacts and a practical and informative UI for the user, the company says. It is designed to support all sampling rates up to 192khz. High frequencies are now processed at double sample rate to get "that open airy analogish high end." New GUI with several bug fixes. Added individual colored graphs on each band. Removed the "Broken modus" and noise generator. New saturation module with more even than odd harmonics if not pushed to hard. Replaces the "Timetravel" saturation. Low pass filter (adjustable 2-8-pole). Frequency response graph with controllable nodes. Left click mouse over and under node to change slopes. Noisebud CatchDad 2.0 NoiseBud has released version 2.0 of CatchDad. Dmitry Sches Diversion Dmitry Sches has announced the released of Diversion, a software synthesizer instrument for Windows. MiniSpillage v1.2 AudioSpillage has released an update for MiniSpillage, a free drum/percussion synthesizer for Mac.